Assistance will be provided for you when you arrive to the airport by one of our representatives after you have landed. You will arrive at Baltra Island in the morning. After passing through immigration and baggage claim you will be met by Ocean Spray staff and transferred to the yacht. You will be shown to your cabin where you will have some time to settle in before lunch and a welcome briefing. The afternoon visit to Chinese Hat, offers rare, up close viewing of Galapagos wildlife and well preserved remnants of fragile volcanic rock that can't be found in such a unique condition anywhere else. The islet is home to a colony of sea lions on the white coral sand beach.? Here you can see American Oystercatchers, Galapagos Penguins swimming along the shores, and Sally-Lightfoot Crabs in bright contrast to the dark volcanic rock. Isabela Island: The largest in the archipelago, this seahorse-shaped island is also one of the youngest and most volcanically active. The morning visit is to Vicente Roca Point. Comprised of two separate coves, this site is a large bay with spectacular sea life. Keep an eye out for seahorses, sea turtles, and the strange yet fascinating Mola-mola (or pacific sunfish). Fernandina Island: No foreign species have ever invaded Fernandina Island and therefore it is one of the world's most pristine island ecosystems. Fernandina is the youngest island in Galapagos. Access to this site is extremely restricted by the Galapagos National Park and you will be one of those very lucky visitors. The volcano "La Cumbre" dominates the landspace with lava fields reaching the ocean. Crossing the Bolivar Channel that divides Isabela and Fernandina Islands, we will land at Espinosa Point. After walking past a colony of marine iguanas and a group of sea lions, we'll reach the island's highlight: the Flightless Cormorant nesting site. This area provides a great opportunity to see the Galapagos Hawk. The morning visit, including Tagus Cove's cliff-side gallery, provides a clear view of pirate graffiti dating back to 1836. The contrast between vandalism and the pristine environment is thought provoking. Up the (1.25 mi / 2 km) hike through lava formations, we will see stunning views of the surrounding slopes and volcanoes, making our way to Darwin Lake. This salt-water crater-lake may have been filled with a tidal wave brought on by a volcanic eruption. In the afternoon, we will land at Urbina Bay which presents some fascinating geological formations. In 1954, an uplift from the sea formed the bay which has been characterized by the resulting terrestrial coral reef ever since. Expect to see stingrays and sea turtles swimming near the surface of the water, along with Flightless Cormorants, pelicans, and marine iguanas. You will be dazzled by the breathtaking view of Volcano Alcedo, with the possibility to see land iguanas and giant tortoises in the wild. The morning visit will take us to Elizabeth Bay, a secluded space lacking any landing sites. We will take a traditional 'panga' ride or dinghy ride, passing the red mangroves and amongst the wildlife of the lively bay. Elizabeth is known for its marine life; you will probably see sea turtles and rays skimming the surface of the water. You may also see Brown Pelicans diving for fish, penguins, Blue-footed Boobies and possibly spot humpback whales In the afternoon we will visit Moreno Point, located south west of Elizabeth Bay. Here, a dry landing onto what was once flowing lava is possible. The lava has left craters in its wake, which formed crystal tide pools. By looking into the pools, you can peer into another world, as the marine life drifts by. In the brackish pools of this area, you may see pink flamingos, White-Cheeked Pintails, and Common Gallinules. If you look carefully into the pools you may see white-tip reef sharks and some sea turtles. In the morning we start at the Charles Darwin Station - Breeding Center "Fausto Llerena" home to tortoises ranging from 4-inches (new hatchlings) to 4-feet long. Here you will observe the various sub-species of tortoises interacting with each other, and possibly with you. Many of the older tortoises are accustomed to humans. The babies are only kept until they are about four years old, or large enough to survive in the wild. These conservation efforts continue to be extremely successful. Here at the Highlands, you can walk along a path, observing the hills, ferns, volcanoes, and rich wildlife. This area is home to giant tortoises, forest, mockingbirds, Bahama ducklings, White-cheeked Pintail ducklings, Darwin finches, and many other species. You will come upon the underground lava tubes, which are more than one kilometer (half a mile) long. Local guides will provide information and flashlights. Walking through the lava tubes is a unique and surreal experience. In the morning, you will head to South Plaza Island. This small island with steep cliffs was formed by rising lava and is now covered by Opuntia cacti. It is also home to one of the largest sea lion colonies as well as colorful yellow and red land iguanas. The most characteristic plant is the Sesuvium. During the rainy season its color is a greenish to yellowish tone and in the dry season (end of June through January) a bright red. Our afternoon visit is to Santa Fe Island. Santa Fe (Barrington) is home to the small picturesque bay and anchorage on the islands northeast coast. The bay has two visitor trails, one leading to a scenic viewpoint atop a cliff and the other spanning from a small beach to a tall prickly pear cactus forest. Española Island is the southernmost island of the Galapagos and is the breeding site of nearly all of the Waved Albatrosses in the entire world. Espa?ola is densely populated with mockingbirds, Blue-footed and Nazca Boobies, Darwin finches, Galapagos Doves, hawks, marine iguanas, and loads of sea lions. In the morning, we will start at Suarez Point on a trail where you will have the chance to see Blue-footed Boobie, albatrosses (From April to December) and Nazca Boobies. We will also visit a beautiful site on the ocean front where there is a cliff that the large albatrosses use as a launching pad! You'll also have the chance to see the famous blowhole that spurts water into the air. The landscape is great for photography. In the afternoon, we will visit the spectacular Gardner Bay & Osborn Islet. After landing, you can walk across a lovely white sand beach amongst a busy sea lion colony or dive into the water to swim with sea lion pups. It is the breeding site of nearly all of the world's 12,000 pairs of Waved Albatrosses. 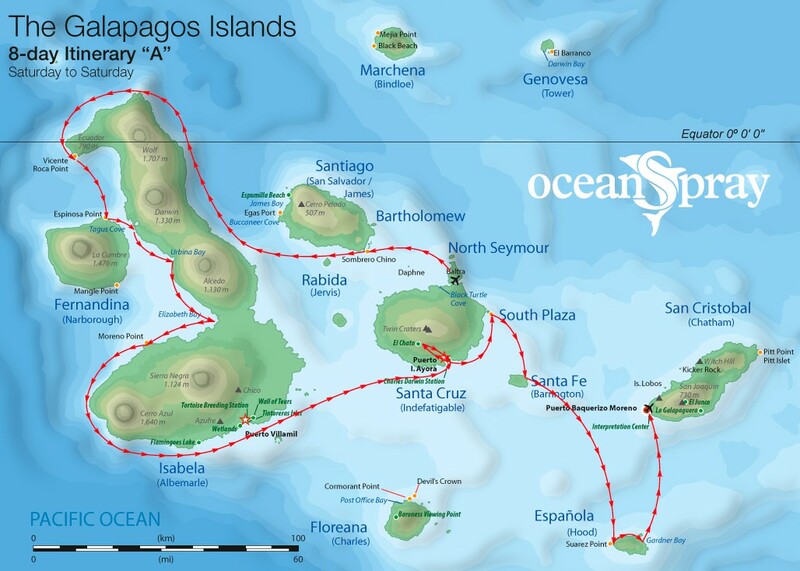 In the morning we will visit the Interpretation Center or Galapaguera on San Cristobal Island. The Interpretation Center is located on San Cristobal Island. The center was donated by the Spanish government and inaugurated by the Prince of Spain in 1998. This center focuses on the interaction between humans and the process of the "natural history laboratory", demonstrating that a harmonious relation between human beings and nature is possible. Cerro Colorado (Galapaguera) is a new visitor site in the southeast part of San Cristobal Island and can now be reached in roughly one hour by road from Puerto Baquerizo Moreno. On the trees and shrubs surrounding the site, you may see land birds like warbler, finches and mockingbirds, and on the trails, giant tortoises. They live there wild but in a protected area to assure their survival by sealing them off from introduced predators, like pigs and goats. Once the tortoise perceives danger, it goes into its defensive stance, retreating?into its hard shell. After this final visit, you will be transferred to San Cristobal Island's airport in time to catch your flight back to the mainland. Please keep in mind that on departure days, your morning visit will be early and short since we need to be prepared before heading back toward the airport for your returning flight to Ecuador's mainland. These Galapagos cruise itineraries are subject to change without previous notice due to weather conditions and National Park regulations. Itineraries of 8 or more days may be scheduled to stop at ports for various cruise logistic reasons and/or for embarking/disembarking passengers. The Mega-Catamaran Ocean Spray offers the best performance and comfort in Galapagos Cruising. The elegant design includes a huge sundeck, Jacuzzi and spacious cabins each with private balcony. Her speed, comfort, top guides and itinerary will make Ocean Spray perfect for your Galapagos Cruise Adventure. Kayaks are also available for use.